WILLEMSTAD – The parliamentary debate with Minister of Social Development, Labor and Welfare resumed this morning at 9. Francisca has long been under fire for the unrest within her Ministry. She will have a hard time this morning explaining what is going on with her various departments and what she is doing about it. The Minister will have to explain the policies and developments within her Ministry. After the resignation of policy director, Mr. Jeroen Jansen, due to lack of confidence in the mutual working relationship, the Secretary General (SG) of the Ministry, Bernice Calmes went home sick. According to the SG, the Minister announced her plans in a press conference, but did not discuss this with her as should be the case. The Minister also announced last week that she had appointed an intervention team to investigate what the problem is in the Ministry and what the solutions could be. This also happened without discussing it first with the SG. 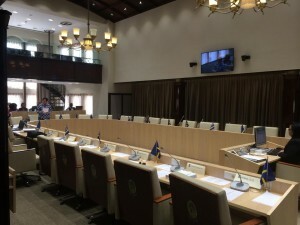 The Parliamentary debate has started and as shown on the picture, neither the coalition nor the opposition is present in the hall to hear what the Minister has to say. According to credible sources, the Minister’s party requested her to resign. The Minister indicated that as long as she has the support from parliament, she will not resign.